Kids scooter sounds like a fun way to put your children to a daily workout. The whole body is used while pushing the bike and this is an excellent way of exercise as well as entertainment. Kids like to take out their scooters and explore the lengths and breadths of the colony with their friends. As much as you want to get your child the best scooter for kids, there are a couple of things that you might want to know. It starts with learning about different types of scooters, and all other details such as its usage, safety, and much more so that you can find the best machine which is rigid, durable and safe. In this guide, I will incorporate all the significant things that you might want to know before purchasing the best scooter for your child. 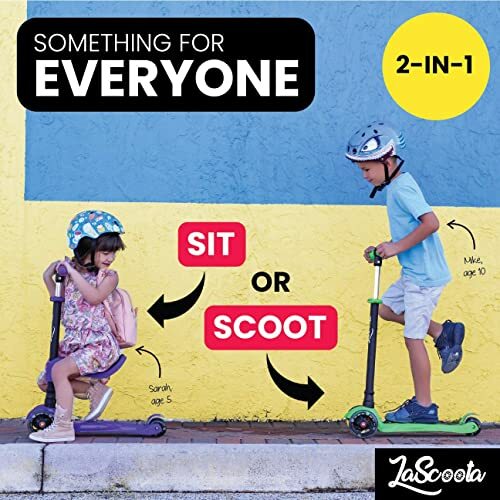 What are the different types in the best scooter for kids? How to Choose the Best Scooter for Kids? How Will My Child Be Safe On The Best Scooter For Kids? Scooters have come a long way since earlier times. It all started when these machines were made with a hand in the garages. Currently, the technology of scooters have advanced, and they are engineered to provide the utmost safety and fun for the kids. The modern scooter family consists of a variety of options. In this section, I will discuss all the different kinds of scooters with their respective pros and cons that you can consider for your child. Clearly, from its name, this scooter has two wheels. 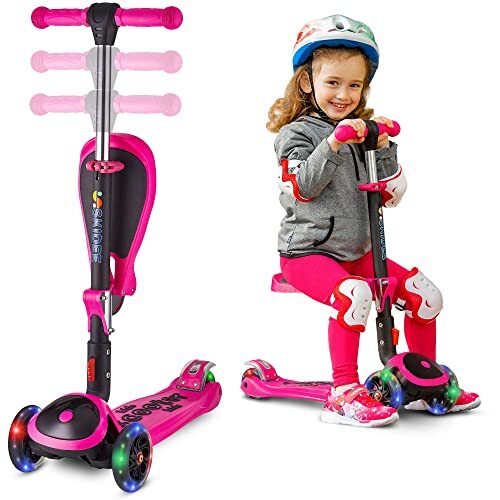 These scooters are best suited for the kids that are older and know how to balance, ideally between 5 – 8 years old kids. Such children can achieve better speed and also bear more weight. 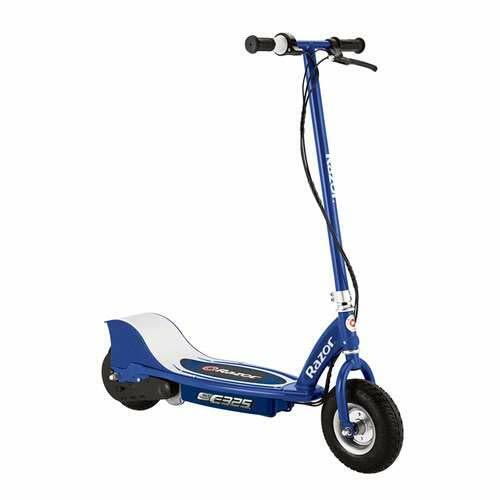 These scooters are usually made of metal material and give great durability to the user. If your toddler is asking for a scooter and you don’t want to risk their security, then three-wheeler is the best choice to make. Most of these scooters have two wheels in the front and one rear wheel. It helps toddlers in balancing the bike. The speed is also quite limited, and they offer excellent stability to the rider. In short, there is no risk involved in getting your child this scooter. These can be your child’s first scooter ever so make sure to find something that he/she can cherish forever. These are battery-powered scooters with an electric motor. You can expect these scooters to be heavier and the wheels are also chunkier. They are difficult to store and transport. However, the extra weight increases the stability of the bike. These bikes don’t make kids use their muscles at all. However, kids have a lot of fun riding these scooters. 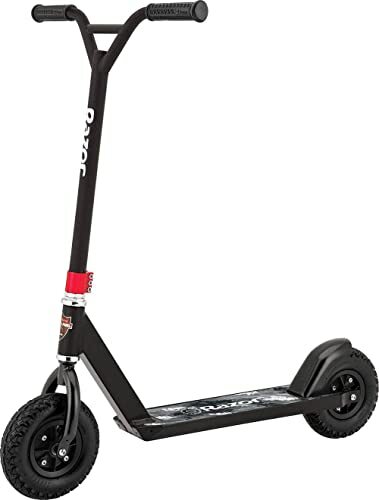 They are expensive than the conventional push-scooters and not suitable for stunt riders. Pro scooters are also known as stunt scooters. These have two wheels and built with a higher quality of materials. These scooters are ideally made for stunt or trick riding. 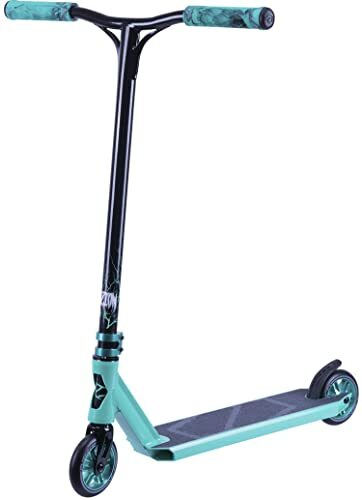 The key feature of these scooters is that they have a wide T-shaped handlebar to provide additional stability while riding on a skatepark ramp. It makes performing flips and tricks easier. 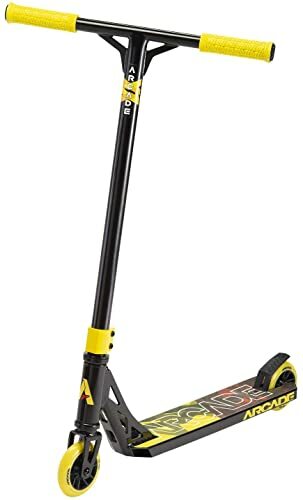 Don’t buy this scooter unless your child is sure about scooting or leaning towards it. The off-road scooters are specially made for elder children who don’t mind taking their ride on rough terrains. Whether you are riding on grass or dirt, these scooters will perform well. They come with chunkier wheels with tires on. These are not meant for stunt riding. So, these are different kinds of scooters that you can buy online. Now, I am going to discuss the things that you should keep in mind while purchasing. Ok, so next step is to know all the details about kid’s scooter. Choosing the best scooter for kids can be an overwhelming experience but with my tips and suggestions below, you will be able to do it seamlessly. If you have a toddler below 5 in age, then a three-wheel scooter is the best-suited choice. For kids, more than five years can handle a two-wheel scooter, preferably if they know how to balance it well. If your child is more into doing stunts, then a pro scooter is a practical choice to make. Lastly, if the child drives a lot on rougher terrains, then an off-road scooter is a purchase to make. You can read more about the types above. So, there are two things about a handlebar that a buyer must keep in head. Firstly, most of the handlebars are in T-shape. There is not much choice on this subject. Secondly, all the handles are adjustable. But some handles give you a hard time adjusting. You have to make sure the one you buy is easy to adjust. While making height adjustments, check for the locking mechanism. Most of these units have quick release clip that you have to pull to unlatch, set the height of your choice, and push the clip back to lock. Quick latch makes adjustments easier than any other mechanism. Even if you have two kids, this feature will prevent the need for purchasing two scooters because as the first one will outgrow the scooter, you can keep it for the second child. There are other models in scooters that allow height adjustment through tools. These tools handle the handlebars securely, but you need to keep them firmly at some place so that they come handy when you need to make height adjustment. Younger children find rear fender hand brake quite convenient. It is simple to apply. While riding, they merely have to step on the rear fender to bring scooter at a stop. The working mechanism of hand brakes is similar to that of a bike. Kids only have to grip the hand brake and stop the scooter. Both of these options are suitable. There are scooters with no brakes as well. In that case, kids need to maintain a controllable speed so that they can stop the scooter by putting their feet down on the ground. The deck is the place where the kid stands while riding a scooter. Decks are available in different sizes, and the wider ones are better at maintaining balance. The thinner ones make scooters lightweight and give you more room to kick. The decks for the younger kids are mostly tapered. They have full front and thinner back so that kicking can be easy. It is essential to look out for grip on the deck so that you can get better footing. The scooters that are made for stunts have a rough surface to prevent slipping. With every scooter, the manufacturers mention the age of the rider. You should be very careful with this feature. Also, it also says about the amount of weight that a scooter can bear. You will be merely ruining your money if these things are left unconsidered. Make sure you check the age and weight compatibility before hitting the “buy” button. So, it’s time for me to share some of the most excellent recommendations in the niche. These products are ensured for quality and performance. I hope you find them useful. Razor is among the hottest selling brands in scooter products. This model is powered by electricity and has the most elegant looks. This model has intriguing features to keep your child one step ahead from the other kids with push scooters. The maximum speed that this bike gives is 15 mph which is good also and controllable as well. It can run for 40 minutes at a stretch after complete charging. Super-sized deck and frame ensure the strength of the scooter. The deck gives enough room to the kid to stand conveniently. The acceleration control is through a twist grip mechanism, and it has hand brake to give full control of the bike in your child’s hands. The high torque and chain driven motor is exceedingly great to ensure high-performance of the bike. Razor E300 is a simple yet fascinating design manufactured by the company. It has got high speed and performance. Another fantastic thing is that Razor is big at providing excellent customer service. You can contact them anytime with your concerns. Sometimes, toddlers also act too needy for a scooter. This model from Lascoota is a dream come true for the new parents whose toddlers are urging for a bike. It comes in 5 different color choices. They all have beautiful lights on the wheels that kids love. Another exciting feature is that there is a removable seat that you can install or uninstall as per your child’s needs. The 3-wheel bike has adjustable T-shaped handle with rubber coverings to ensure firm grip of the child. It is a self-balancing, quiet scooter that provides excellent stability and balance to the child. It keeps accidents to the minimum. The big front tires are there to ensure its running on all kind of terrains. The child has to lean towards the handle to make a turn. You don’t have to steer the handle for its operations. The making is done with aluminum alloy wheels and stainless steel parts to withstand abuse by the kids. It is rust and corrosion-free model. This is a fancy little machine that every toddler would love to have because of the super fancy features. At the same time, it is quite pocket-friendly. The adjustable handle ensures that the bike will not go out of use, even after your child grows up. Just like the previous model discussed, this one is also a 2 in 1 scooter. It has a seat installed on the handle that can be removed too. You don’t even have to remove the seat. Fold it up and let your child have hassle-free riding experience. The three-tire scooter comes with great balance. The steadiness is ensured with the lightweight yet durable aluminum. The buck wheel comes with a hand brake system to give full control over the bike. This is also lean to turn steering that helps kids learn how to balance correctly. The full footbed gives enough room to the child to ride the bike in a sitting or standing position. This model comes with a 1-year warranty. You can also get it extended to 5-years by paying some extra charges. SKIDEE scooter is a great model for toddlers. The manufacturing is brilliant, and it comes with all the features that you might want in a kid’s scooter. So, the next model to be discussed in my list is this amazing product from 6KU. There is a lot of variety of colors in this scooter. Plus, it is also priced suitably for all kind of buyers. The adjustable handlebar makes sure that this scooter is put to use from the age of 3 to 8. You can buy this for your toddler, and it will stick around until the child grows to a period of 8. The LED flashlights on the wheels are especially popular among kids of small age. The lights will glow as you push the scooter. Also, they don’t cause a scratch on wooden floors. Your little one can learn how to control and balance through the lean and turn technology. The lightweight scooter is safe for the kids, even if they accidentally had it on them. The extra-wide deck makes it comfortable for the kids to hop on and enjoy the ride. Also, it comes with rear fender brakes to give extra control over the scooter. The scooter has been well-liked by the customers for its simplicity yet excellent features. The cost is also quite affordable. There is nothing in this scooter that you or your child wouldn’t love. If you are looking for a practical choice to make then, this scooter has no exceptions. This is another fantastic model from Razor that has been doing splendidly well among customers. The first thing that you should know is that this is a two-wheel scooter. This means that if your child is weak in balancing then better avoid this product. This model is made for kids that are good in balance. It has a heavy-duty aluminum frame, and the tires are designed to withstand abuse. The deck is slightly smaller than other models discussed in this review. However, it still gives you enough room to accommodate both feet. Also, the deck is wrapped with coarse grip tape so that the child doesn’t slip while riding. It comes with rear fender brake which is convenient to apply. It can hold weight up to 220 pounds and suitable for ages 8 or above. This scooter is not limited to the pavements. Your child can take to the road as the tires installed in this machine are suitable to handle rough terrains. It is surprisingly well-built, and your child will find it extremely comfortable to ride. 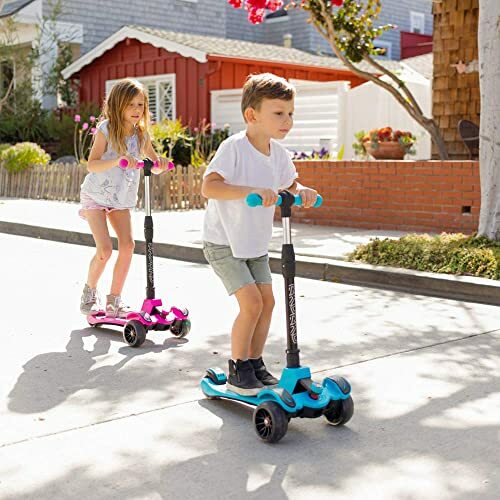 The Fuzion Z300 is a super fancy scooter for kids above 8. This is a two-wheel scooter with a solid body and stunning looks. It is available in three color variants. All of them are equally amazing, and your kids will find a hard time selecting one of the options. The two-tire scooter is all about balancing. This one is great for intermediate riders. As I mentioned in the title, this scooter is for stunts and tricks. It is made with rigid material that can make scooter withstand the jumps and jerks off the road. The wheel material is 110mm Alloy Core wrapped in 88A PU. It has smooth nylon brakes. The deck is ¼” full which give enough room to the child. The lightweight bike can accommodate kids with up to 220 lbs in weight. The stunning looks of this bike in a sleek profile are great to fascinate the buyers at first glance. This scooter is made with rigid materials and great for the stuntman. The wheels are also quite amazing and give you the freedom to perform stunts. 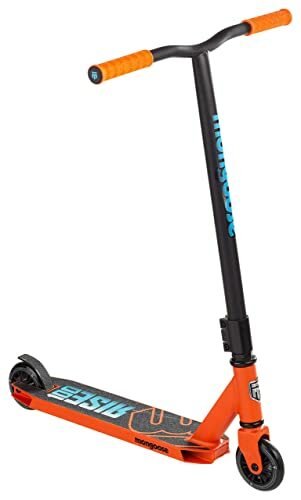 The Mongoose Rise 100 is also for the kids that have practiced riding a scooter and wishes to perform tricks and stunts with it. Customers have liked the scooter a lot for its features, construction, and performance. It is a promising product. Firstly, there are multiple color choices available in this model that your children will love. There is almost every color that they ever wished they could have. It is rightly priced and available at affordable cost. The lightweight alloy deck has sufficient standing area for the kids. This one comes with rear-fender brake and 100 mm high impact plastic wheels to offer non-slip riding. The wheels are also extremely durable. The one-piece welded T-shaped handle is made of steel. It is adjustable, and the bike-style grips have rubber covers on it to prevent slipping of the hand. This is a heavy-duty product with exceptional crafting. It can bear weight up to 220 lbs. The color versatility is also one of the critical features of this model that you will appreciate. I like everything about this model. The last model that I am going to incorporate in my list is this fantastic bike from Arcade. The product is available in three beautiful colors. As far as price is concerned, it is similar to many others on this list. Overall, I appreciate the quality of this scooter. It is a lightweight two-wheel scooter for the kids that want to start learning balance-making. The designing is done thoughtfully with kid’s taste in perspective. The bearings of Arcade scooter is fitted with ABEC 7. The T-bar handle is wrapped with customized with 117 mm TPR grips. It ensures smooth rides and responsive brake system. It gives peace of mind to the parents also as the scooter is quite dependable. The tires are made of extremely dependable material. The weight is also controllable. This scooter can bear weight up to 220 lbs. This is an amazing pick from the pool because of all the features. You can also enjoy 30 days of money back guarantee and warranty on demand. All these things make your purchase completely risk-free. Always make your child wear a helmet while riding. Also, make sure that the helmet is well-fitting. You should take your child to a park for riding so that they can practice a little. Always make sure that in the beginning, the kid is supervised by an adult. Teach your kids all the basic traffic rules such as stopping on the lights and check before crossing the road. Make sure that the kid does not take the scooter out in the rain. It can lead to accidents. By taking care of these little details, you can ensure the safety of the child while riding the best scooter. Here I am going to discuss some important and frequently asked questions that most of the buyers have. How much should I spend on a kid’s scooter? Well, there is no fixed price. There is a variety of brands that manufacture kid’s scooter. Their features and material make a massive difference to the cost. First, create a budget and then search for a product that you think is highly suitable. Yes, the handlebars come with different locking and height adjustment mechanism. You can increase or decrease the height of the handlebar as per your kid’s changing requirements. Is kid’s scooter water resistant? Yes, these bikes are water resistant. Considering that these are used in the outdoor environment, the materials used in the making is not only water resistant but also rust and corrosion resistant. How to look after a child’s scooter? Most people that have two kids like to store the scooter so that the second kid can also use that. For that, you need to maintain it. You can keep it inside the garage, preferably in some cupboard. These are light in weight so they can be managed pretty well. Also, it is essential to keep a watch at the screws and nuts and tighten them time to time to ensure the security of your child. Kids scooters also give a reason to get them outdoors and also make them exercise. I recommend that if your child is not in right shape then don’t get them electric scooters. Let them use their muscles in pushing the scooter so that they can drop down some calories. All the models discussed above are fantastic. They all are made of high-quality materials. You can expect these models to last longer because of adjustable handles. You can keep lifting the handle as your child grows. I hope this guide will help you in sorting the best scooter for kids. Stay tuned with me for more exciting reviews. Happy Shopping!